NOW AVAILABLE in a completely preprinted format for your convenience! 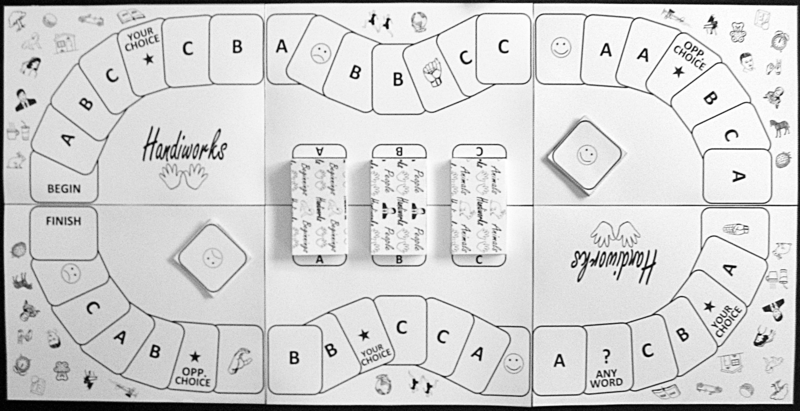 The game board and its parts come together in minutes with only scissors and postal tape, and all vocabulary cards are perforated to separate easily. 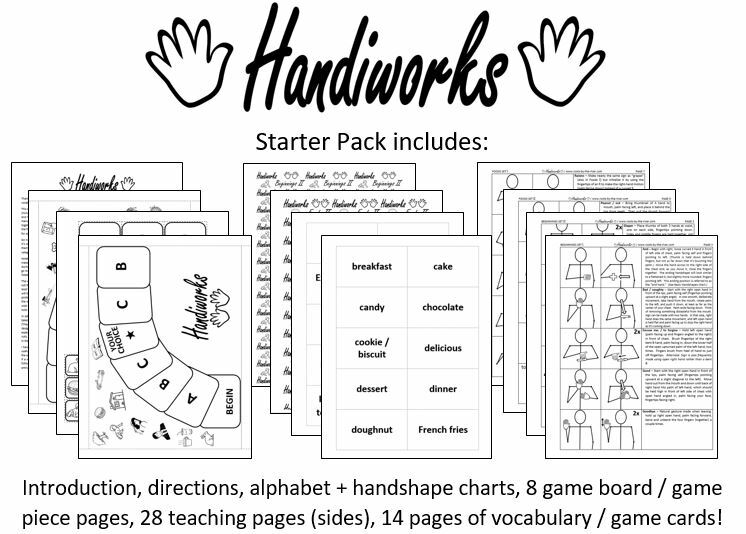 The board, game pieces, teaching pages and vocabulary cards are on cardstock for durability. The game has simple rules and can be played by the whole family together. The product is fully adaptable – begin with only a few cards in a category or set aside cards you’ve reviewed recently, etc. You can use individual decks of cards apart from the game board for review on the road. 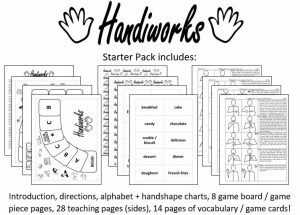 The game can also work as a supplement to any ASL book or program. I am not an ASL instructor or interpreter. I’m a hearing mom who has enjoyed studying sign language and using it with my children. At various times we have learned signs to go along with songs, Bible verses, and basic daily conversation (all in spoken English) in our home. 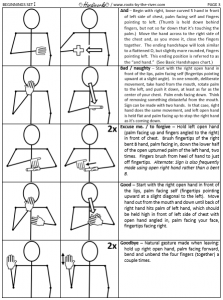 We sign in English word order and sign while speaking aloud (a common way for hearing people to communicate with the deaf). 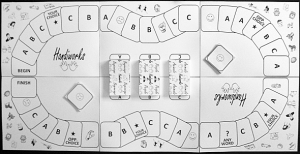 ASL also has a syntax and grammar of its own which is not taught in these sets, though the signs themselves will carry over if someone wishes to pursue more in-depth study of ASL in the future. I have endeavored to choose signs which are traditional and highly recognizable, though there will be regional variations in sign just as there are regional variations in speech. My purpose in creating this product is to give other families a simple, fun way to learn and review basic signs together. I believe using signs in the home can: (1) encourage infants and children who are not yet verbal to communicate earlier, (2) encourage older children with a range of speaking abilities to express themselves better, (3) encourage parents and grandparents to learn signs in preparation for a future in which they may find themselves with hearing loss, and (4) encourage individuals of any age to study ASL as a language so to communicate with the deaf. Please keep in mind that the stick figures give you a general idea of location and basic handshapes for the signs, but it is very difficult to completely accurately represent 3D motion with 2D figures, so please carefully read the entire description accompanying each sign. Use the pictures and the words together.